I’ve been so excited to share this recipe since perfecting the concept this summer. 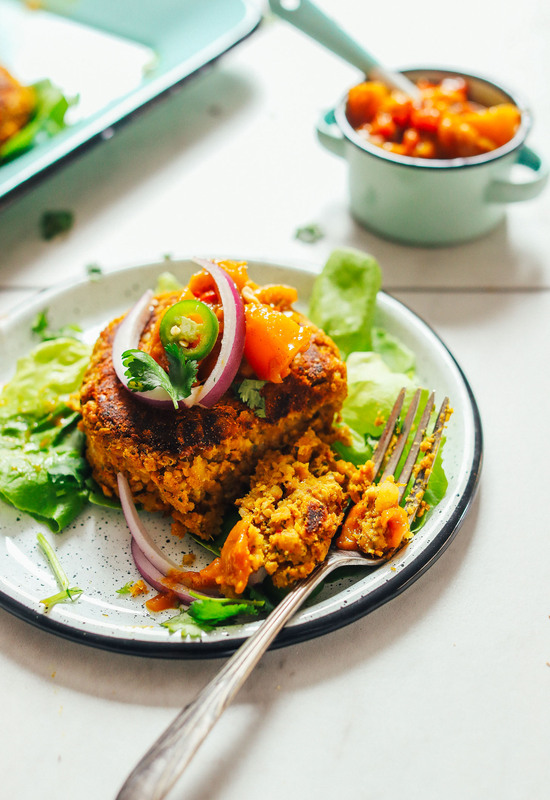 I’d been dreaming of a curry-infused chickpea burger for a while. And although it took me several tries to nail, it was totally worth the effort! Friends, it’s burger time. 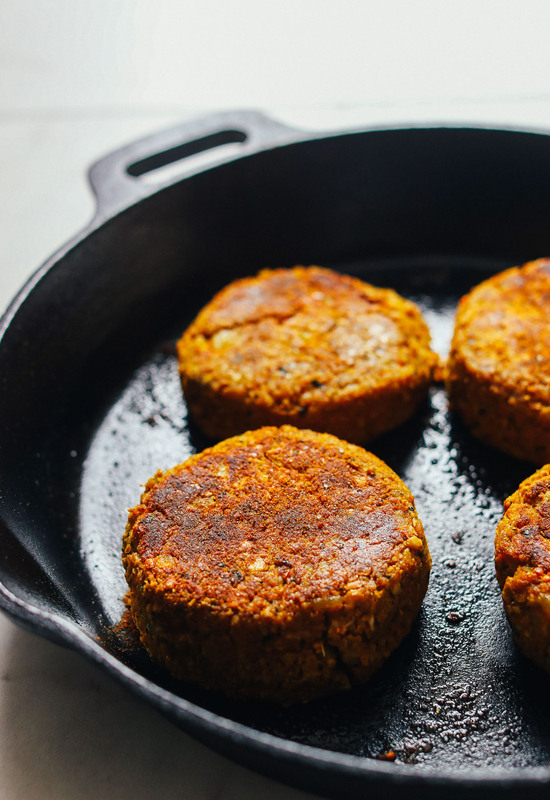 This 10-ingredient burger is made with cooked quinoa and baked chickpeas. 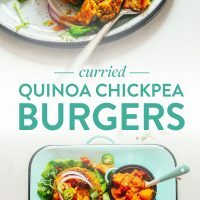 The chickpeas provide plenty of plant-based protein and fiber, while the quinoa helps bind the burger and stay together for cooking. Serrano pepper adds heat, ginger adds spice, and garlic infuses plenty of zingy garlic flavor. Lastly, my go-to curry powder injects tons of gorgeous flavor in one fell swoop. The last element is cooked potatoes that are mashed, seasoned, and stirred into the quinoa-chickpea mixture. This helps round out the flavor and texture super well and adds even more carby goodness to the mix (swoon). All that’s left to do is cook! We opted for a quick sauté in a cast-iron before finishing in the oven to continue cooking the burgers through. These would also probably grill well (if done gently). Might we suggest the perfect way to enjoy these gorgeous burgers? Serve atop lettuce or a green salad and plenty of our Spicy Mango Chutney! The pairing is out of this world! Take it a step further by adding our Green Curry Tahini dressing for even more big flavor. These burgers would make the perfect healthier meal when you’ve got a little more time on your hands and want to impress family or friends. They are ideal for making ahead of time (and in larger batches) for future meals. My preferred method is to make a double batch, enjoy half through the week for lunch or dinner, and freeze the other half for future busy days! 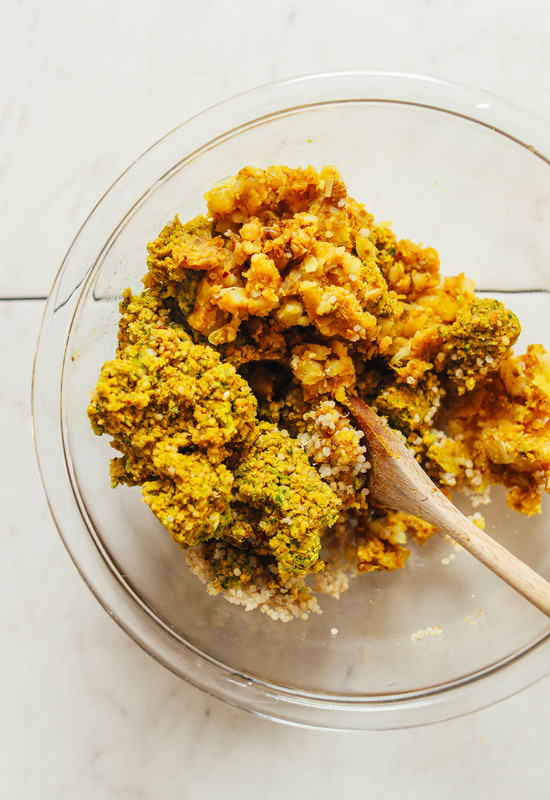 For more Indian-inspired recipes, check out our Cauliflower Rice Kitchari, Aloo Tiki with Green Chutney, Mixed Vegetable Pakoras, Easy Vegan Naan, and Easy Chana Masala. If you haven’t prepared your quinoa yet, do so now (make sure it’s cooked and cooled completely before use). Preheat oven to 375 degrees F (190 C). Add rinsed, dried chickpeas to a parchment-lined baking sheet and toss with oil, salt, and curry powder. Bake for 20 minutes or until chickpeas appear cracked and feel dry to the touch. Remove chickpeas from the oven and set aside. Keep oven on. In the meantime, add diced potatoes (smaller / bite size) to a rimmed, oven-safe medium skillet along with oil, salt, and curry powder. Cover and cook for 4 minutes. Then decrease heat to medium low, add water, and cover again. Continue cooking potatoes until browned on the edges and tender. Then turn off heat and use a fork or potato masher to mash them until nearly creamy (as few chunks as possible). Set aside. 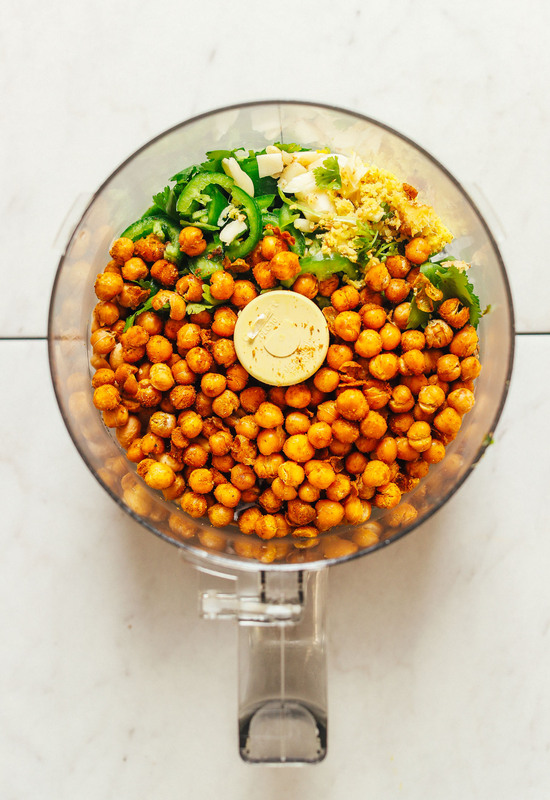 Add cooked chickpeas to a food processor along with cashews, serrano pepper (optional), ginger, garlic, salt, curry powder, harissa paste, and cilantro (optional) and blend into a semi-loose dough. Then add cooked/cooled quinoa and pulse to combine until a textured dough forms (you're not looking for a purée). Transfer mixture to a mixing bowl and add mashed potatoes. Stir to combine (it’s important not to add the potatoes to the food processor or they can become gummy when overmixed). Taste and adjust flavor as needed, adding more curry powder for intense curry flavor, salt for saltiness, or harissa paste for more spice. Heat the rimmed, oven-safe medium skillet (from earlier) over medium heat. Once hot, add a little oil and the burgers and cook for 2-3 minutes or until bottom side is golden brown. Flip and then transfer pan to the oven to bake for 12-15 minutes (baking in the oven is an optional step, but one that ensures the center is fully cooked). For serving, enjoy in a traditional bun, with naan, on a salad, or wrapped in a butter lettuce leaf. Add (optional) sliced red onions and mango chutney (total swoon). Store leftover patties covered in the refrigerator up to 3-4 days. If you want to freeze them, either freeze once cooked and cooled OR before sauteing and baking. Add patties to a freezer-safe container and freeze up to 1 month. Reheat in a 375-degree F (190 C) oven until warmed through. *1 can chickpeas drained equals about 1 1/4 cup beans. *Prep time does not include cooking and cooling quinoa. *For smaller burgers, use a 1/2-cup size measuring cup instead of 2/3 cup. *If cutting back on oil, be sure to keep these burgers on a non-stick skillet. Otherwise, they can stick. *Nutrition information is a rough estimate for 1 of 4 chickpea burgers without optional or serving ingredients. WOW!! I’m officially obsessed with these!! 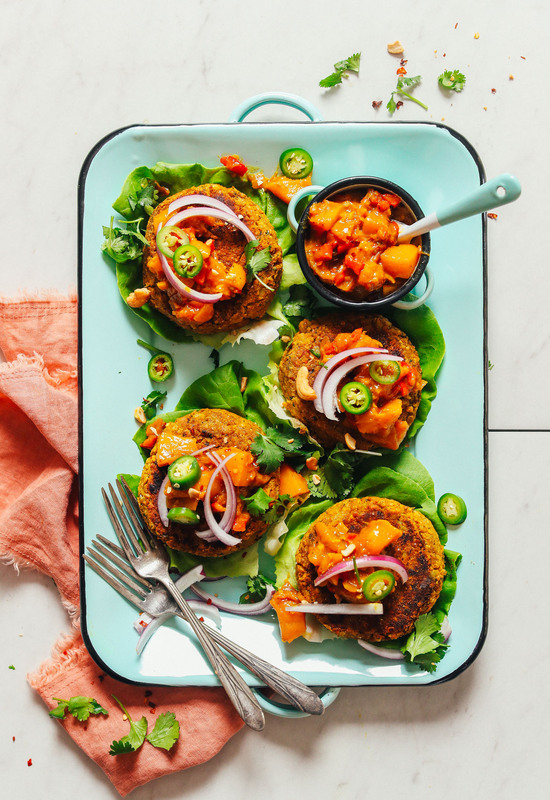 Savory, crunchy, spicy…these patties have it all. Thank you for such a wonderful recipe. It’s no exaggeration that I make your recipes at least 5 nights a week. You have made my life as a vegan so amazingly yummy and complete. Thank you!!! Yay! We’re so glad you love them, Celes! We just LOVED these burgers! I used tomato paste instead of the harissa paste but otherwise followed the recipe and it turned out wonderful. In the chickpea burgers can you substitute sweet potatoes for yellow potatoes? I made this with some changes: I used sweet potato instead of white due to my need to avoid the nightshade family of foods and it came out great: Also made it much less spicy for health reasons. Smart! Thanks for sharing, Eileen! I always come back to Minimalist Baker recipes but they are a hit every time! I made these tonight from another plant based friend and she loved them. Just enough curry taste and spice, we added tomatoes, avocado and some vegan mayo on the buns.. very satisfying. I was so excited making these that I misread the quinoa instructions- I made 1 cup of dry quinoa. Super disappointed as I ruined the entire dish. I was tasting as I went a long and they were sooo yummy! Will need to try to make it using the correct instructions next time!! Yum Yum Yum! What a wonderful recipe!! Everyone in my house loved it. I served it with lettuce and mango chutney. The only tweaks to the original recipe I made were as follow: I used ground ginger instead of using fresh ginger (1/4 tsp for 2 tbsp fresh). I didn’t add serrano pepper, and I actually forgot to add tomato paste, but still a textured dough formed and nothing crumbled up during the cooking or baking. Very pleased with how it turned out :)! These burgers were yummy! To save time I substituted crumbled, leftover baked potato for the cubed/sauteed, used drained/rinsed chickpeas (did not make), omitted cashews without a substitute because of a nut allergy, and cooked the curry in 1 tbsp of avocado oil to bring out the flavor before dumping it into the mix. Oh, I also used canned chipotle peppers (seeds rinsed out) in place of the harissa. Baked in the oven for 12 minutes each side as another reviewer had mentioned, which worked well. Topped with the mago chutney. Very tasty, and came together pretty quick. Thank you! Smart! Thanks for sharing, Michelle! Solid 5 stars, I absolutely love this recipe! The only modification I made was using a fresh jalapeno because that’s what I had on hand. I also had no cilantro and I can’t wait to make it with that. They are a bit crumbly but not dry. My patties were enormous because I made them flatter than shown because I wanted to be certain the middle would get cooked. I’ll make 6-8 patties next time. Lovely! I was excited to make this and thought it would be really good but it came out dry and kind of bland. Hmm, not sure how it would be bland. Did you make any adjustments to the spices or quantities? As for crumbly, maybe try adding a bit more water to the potatoes while steaming and mashing so there’s more moisture overall. Made this and loved them . Only veggie burgers I have made that stay in one piece ! We are glad they worked out for you, Sophia! Another brilliant recipe. I opted to skip cooking them in skillet and baked them for 12 minutes on each side on a baking sheet. They came out beautifully but less browned than yours. Glad to hear that, Dan! This was my best dinner and veggie burger to date. This was also my first chutney. I can’t wait to make them both again and again. Thank you!!!!! Yay! We are so glad you enjoyed it, Michelle! I made these exactly according to the recipe, and they were great! The only thing I would change is to cut back on the potatoes. I think my patties would have held together without so much potato, and I felt like the potatoes really dampened the flavor. Other than that though, they were great! I didn’t have any problems with them falling apart while cooking, and I served them with the mango chutney which was a big hit! These are the best veggie burgers I’ve ever made. Hands down. We are so glad to hear that, Emily! I love so many recipes from your website; but I have to say this one is beyond amazing! I don’t know how you do it, but to turn these vastly different ingredients/spices into such a complex taste is pure talent. I ate these with some green (cilantro) indian chutney. At first, when I started making this, it was so much work that I regretted it but the finished product was absolutely out of this world delicious! My husband loved it so much that he said he wants to eat it for every meal! We will be doubling the recipe and having a reserve of this burger in the fridge at all times from now on! Thanks so much for the amazing recipe! I just made this burguers and I must say…mine look nothing like yours. The mixture was way too dry and the burguer did not hold. They fell apart the minute I tried to put them in the pan. They were all crumbly…..the taste was spot on but…..not resembling a burguer at all. It’s more like a chikpea/quinoa curry crumble? !What can I do to make it more moist? Hmm, check the above comments for texture troubleshooting. Mine definitely weren’t crumbly, but I can see how they can be difficult to get right. Next time make sure to completely cool your quinoa, blend the chickpeas really well, and make sure your potatoes are well mashed. That should help! Love these! I’m saving my last one for after my workout today :-) They’re pretty filling. One thing I did that made the prep of these not seem like so much was to make some things a day ahead of time! I dried out my chickpeas, made the quinoa, soaked the nuts and and diced my potato the day before. Made cooking them the next day a breeze. Also I used sweet potato instead of regular and really enjoyed it. Greeting from Vancouver, Washington (across the mighty Columbia River)! My wife and I have been eating a plant-based diet this month as part of an internal Kaiser Permanente challenge and we’ve been all over your recipes for ideas besides salads. This recipe is the third plant-based burger recipe I’ve tried and you are right, it’s spot on and excellent. The flavor profile is wonderful… hints of ginger perfectly complement the curry and the substance is very sustaining. I added in some chopped carrots, which also works well with the curry and barley to give it more mouth texture. The problem I’ve found (third time making this recipe) is the binding, as others have commented. They shape well, but when flipping in the pan, they tend to fall apart. I read your previous comments about ensuring the quinoa was chilled, etc. and that’s not working. I’m wondering if adding some potato starch (make a paste with water) would work to help keep them together? Love your recipes, your Instagram account (I’m also a professional photographer) and the invaluable resources you offer and your commitment to keeping it pure with regard to sponsors, etc. I sincerely appreciate the hard work, passion and commitment to sharing. You’re making the world a better place! Thanks for the kind and thoughtful response, Randy! I’m wondering if people’s potatoes aren’t as “mashed” and creamy as mine are. Perhaps adding a little moisture there would help? Otherwise, someone cited success with a little chickpea can brine (aquafaba). Hope that helps! All I wanted to say from the start is: Darn it, I should have start by the Burger. HO GOODNESS !!! I am still eating your banana bread and there I found this Garbanzo BURGER??? It is Burger time. Got to soak my chickpeas. Due to allergies, I ll substitute eggs for Chia. Chia is a great binder. I cant wait to have this with green lettuce and fresh cut tomataoes in Olive oil/salt. Lets throw in Advocato slices, some chives and maybe a hint of fresh squeeze lemon in my oil. mm mmm mmm cant wait. I made these burgers and they are fantastic! I have been taking them to work for lunch for a week because the recipe makes more than just four burgers. As I was eating the burger today, I realized that these burgers might make a wonderful vegan malai kofta dumpling. Malai Kofta has been a favorite dish that I have had to avoid since I became a vegan a few years ago. I am going to experiment with using this recipe for the dumplings and see if I can veganize the tomato cream sauce to make a vegan Malai Kofta. Whoa, smart! I hadn’t thought of that! We’ll keep that in mind!! It has been a while since I had actually cooked something since it’s been so hot, so it took me a lot longer to make these and the mango chutney than it probably should, so I am really glad that I doubled the recipe. I just reheated my second one in the toaster oven at work, and it was absolutely delicious! I’ve been eating them over butter lettuce, but for some reason I’ve been daydreaming about putting them on a bun with some Dijon. Luckily, I have a ton of them to go through and ample chances to experiment. I love Indian food and usually find my homemade forays to feel very Americanized, but the flavors were perfect and they put me in the mind of samosas. I will definitely be making these again. Thanks for sharing, Daryl! Glad you’re enjoying them! I have leftover mashed potatoes to use. What’s the total amount of mashed potatoes to use in burgers? This was a great recipe! Flavorful and very satisfying. I added an extra tablespoon of harissa paste to satisfy my taste and it was easy for me to form into patties. I served it with the Mango Chutney as suggested. Excellent! Thank you! We are glad you enjoyed them, John! This was so amazing. I have never had a veggie burger recipe that held its shape so well. I loved it and my kids actually ate (some of) it too! But it made WAY more than 4 patties. I had 7 and they were HUGE. Maybe we just eat smaller burgers here? Yes, they make four fairly good sized patties. We are glad your family enjoyed them, Leigh! 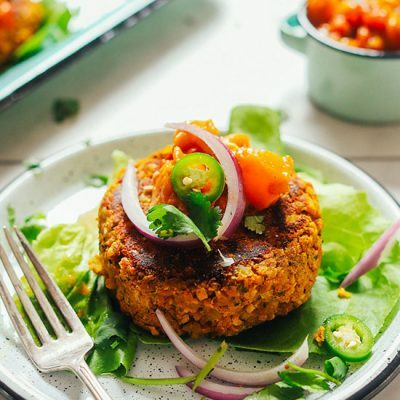 i love the curried quinoa chickpea burgers, not sure if they will turn out just as great if i were to grill or bake them! I think both could work! The burgers tasted good but were a little crumbly. Adding a ‘flax egg’ to the recipe might help. I also thought the recipe was a bit too cumbersome and time consuming. I am going to try to make it without drying the chickpeas in the oven. Thanks for sharing. These are definitely a little more complicated than other burger recipes of ours but I liked the result! I didn’t find they needed any more binding, but yes, a flax egg might help if you’re having trouble with crumbling. I just made these burgers and they turned out delicious. They were so full of flavor! My only complaint is that they crumbled in the pan and did not stick together like veggie burgers that I have made in the past. Any tips? Thanks! Hmm, strange! I wonder if the quinoa wasn’t fully chilled and not yet tacky? Or if the potatoes weren’t cooked well enough so they didn’t mash completely? is it 1 and 1/2 cup potato or just 1/2 cup? Do I need a food processor? Is there another way I can mix it to make the dough? It will be more work, but you could probably mash and mix in a mixing bowl! I just want to say these burgers are AMAZING! I followed the recipe exactly and I served them on butter lettuce then topped with the Spicy Mango Chutney which make them even more AMAZING! I have made several of your recipes and have loved them all. I really appreciate the storing suggestions. I’m the only vegetarian in the house so being able to freeze my leftovers is SO helpful. I made these the other day, exactly as written, and they were FANTASTIC! Hands down some of the best veggie burgers I’ve ever had. A question, though, not specific to this recipe. I’ve made all sorts of veggie burgers both from Minimalist Baker and elsewhere. I can never — and I truly mean never — get the darn things to bind. A good 80% of the burgers fall apart. The same is true in this case. I can only assume I’m doing something wrong as I’m the only common denominator. How can I improve the bind of my burgers? So glad you liked these! And thanks for sharing. As for these being crumbly, that shouldn’t be the case. I wonder if the quinoa wasn’t fully chilled and not yet tacky? Or if the potatoes weren’t cooked well enough so they didn’t mash completely? I made these using butter beans, and not so much Harissa, but added a bit of lemon juice. They were great. Thanks for the recipe. Great! Thanks for sharing, Norine! If I were to make these a day in advance, how would you recommend I go about that? Make through the actual cooking step? Or go ahead and fry/bake ’em and then warm them up in a skillet or oven the next day? Any suggestions? Thanks! I can’t wait to try them! I would say make them up to the point burgers formed but don’t cook. Refrigerate and proceed with recipe as instructed the following day. Hope that helps! LOVE this recipe! so simple and looks very tasty, cannot wait to try it!!! Made these tonight just as printed and WHOA! Soooo good! I will say it is rather time-consuming but worth it. Next time I will double the recipe in order to get another meal. I also made the Chutney and it is also amazingly delicious. ThankYou once again Dana! Has anyone tried baking these?? They are baked at the end, just sautéed first so they get a little browned. I made this for my husband’s bday with tamarind chutney! So yummy he loved it & we have two leftover for dinner tonight! Amazing recipes! ✨I will try some of these. 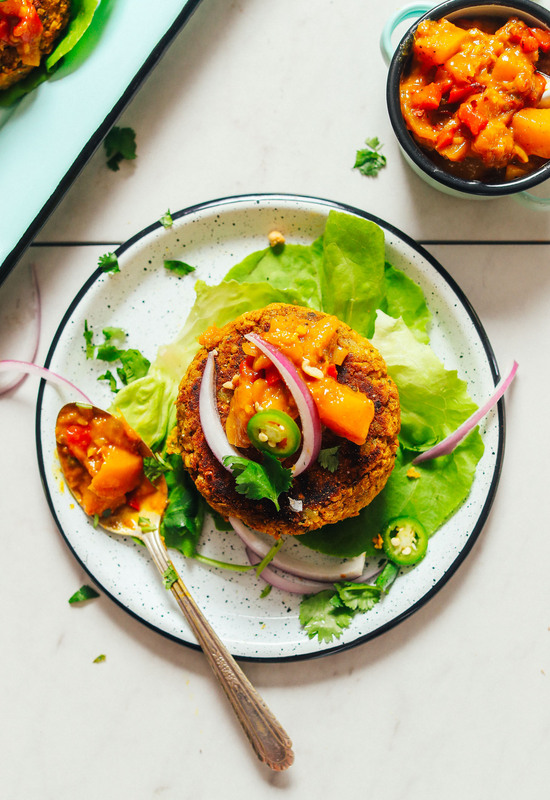 I absolutely love veggie patties, and these look pretty delicious. But it sounds like quite a bit of work, with all the baking, cooking and preparing. But I will definitely try the flavour combination! Thanks for the inspiration. I tweaked these so much (no patatoes, kidney beans and chickpeas), I almost feel I shouldn’t comment, but I still will because I kept the flavors (curry, harissa, garlic, ginger) as they were meant to be and it’s great! Juste the right heat, it’s full of taste! Try it (tweaking it or not. ;)). Thank you Dana! Would you mind sharing were you got the blue serving plates and speckled (blueish) dishes from? I cannot stop thinking about how cool they are! Made these for dinner tonight and love them….though my mouth is a wee bit on fire! I took the suggestion and made the mango chutney as well …so good! I’ll probably swap out some tomato paste for the harissa next time, but definitely adding to my recipe rotation. Thanks! My daughter and I were inspired to make these and they are delicious! They make generous patties but I didn’t have trouble eating mine ;-). We also doubled the recipe as we have several vegans in our home (and we like leftovers). We used Thai curry paste, skipped the Serrano pepper (I bought it but my daughter was hesitant to use it), but otherwise followed the recipe (even though it was hot here in San Diego, it was worth cooking these!). The flavor combination is terrific and the burgers have very nice consistency. We added sliced avocado on top. Making these did take some time….even with both of us working in the kitchen…but a very nice dinner! Thanks so much for this recipe! Lovely! Thank for sharing, Karen! Perfect timing to receive your email! I was just looking for a new veggie burger for this upcoming weekend and this is it. All items in stock and a trip to the Farmers Market for the potatoes. I always have great results with your recipes Dana and, I do appreciate the “metric” conversion. So much easier to use the scale vs all of the measuring cups. Yay! We are glad that the new feature has been helpful to you, Susan! I can’t wait to try these because it has three of my favorite things: curry, quinoa and chickpeas! These look so delicious! I want to try your kitchari, chutney, and your easy vegan naan as well one day. You come up with the most glorious Indian-inspired recipes! I made these and they were fantastic! Thanks for the recipe! I saved a little time by using canned chickpeas that already had curry added. I didn’t do the baking step, but they seemed to work fine. I put my burger on a bed of shredded cabbage from a kit (for fish tacos) that came with a nice cilantro dressing. I added cucumbers, celery, grape tomatoes, purple onion, some cilantro leaves, a bit of broccoli and added the burger patty, which I topped with some avocado|mango salsa I had made recently. Delicious! My only advice would be to make sure you get a nice crisp on the burger. I baked mine a little longer for that reason. Great tip, Su! We are so glad you enjoyed them! Can I sub sweet potatoes for white. I do not eat white potatoes. Exactly me question. Sweet potatoes seems like it would work well. The recipe looked so fabulous that I went ahead and doubled it. So glad I did. I substituted smoked ketchup for some of the curry paste – and, for curry powder, used Penzey’s Maharaja. I absolutely love the addition of fresh cilantro. Flavor is off the charts. I love how your recipes allow for creativity and ingredient riffing. This recipe looks great – I real winner – I can’t wait to make these burgers. I, too, would like to know if millet or anther grain can be used instead of quinoa as it does not agree with me. Many thanks. I would think brown rice, quinoa, or amaranth would work here! Thank you. What about millet? You make amazing and tasty recipes. Have you thought of opening a chain in some target cities in the US and San Miguel de Allende, Mexico? So kind! We don’t have any plans to do so at the moment, sorry! Hi Dana! Could I substitute quinoa for millet or brown rice? Those are the only grain I have at the moment. Thanks for your work, this recipe sounds delicious!! I would think so, but I haven’t tried it. Let us know if you do! Thanks for the inspiration Dana. I’m definitely going to try these…just wondering of the significance of oven cooking the chickpeas in advance? (it is so hot in Spain, where I’m writing this, that I’m trying to minimize oven use.) I might experiment doing a shake around a skillet with the curry powder to infuse the chickpeas. If not ‘spot on’ I can be more obedient next time. You might be able to get away with a skillet roast. The main point is to get some of the moisture out otherwise the burgers can get a little mushy. Thanks – the skillet worked fine for chickpea roasting and cooked fine in skillet too, aside from a couple of self-detonating chickpeas…whilst roasting Bonus too getting a strong approval from hubby. So all in all strong success thanks. Planning a tomato salsa as side too next time. Agree the chutney perfecto. I do not use canned beans, so I was wondering if I can use dry chick peas instead. Cooking them first and then putting them in the oven? My husband can’t eat cashews so what is an appropriate substitute? Yep! That should work. As for cashews, I’d recommend subbing pumpkin seeds, walnuts, or pecans! Looking at the ingredient list it seems as if these would be incredibly dry. Are they dry? Also…you say that the quinoa is used as a binder. What binding properties does a low-fat seed have? So up for learning more! Thanks! So the trick with veggie burgers is to make them bind but not be mushy. The quinoa is really the binder in this recipe and it doesn’t need much more moisture! Trust me! They’re on point! Can this recipe be turned into “meat”balls? If so how? Any substitute for the nuts in your recipes? Thank you! These look fantastic! I have an intolerance to chickpeas and wonder if subbing white beans (using the same method as one would do with chickpeas), would give a similar result? Hmm, it’s worth a shot! Let us know if you try it. I am curious about Dana’s thoughts but I’ve not had much luck with white beans for chickpeas (subs made due to Pantry issues rather than intolerance) . White beans are less floury than chickpeas. Maybe kidney beans or black beans? This looks absolutely divine; I’m most definitely going to make this. I’ll let you know how it came out.